My friend and fellow teacher came up with the idea and then after she left to stay home with her gorgeous wee one another co-worker followed through with the idea. Whether you are a teacher, parent, or just a concerned neighbor or friend this could become a great annual Easter tradition. Here is a wee poem you could use and adopt. 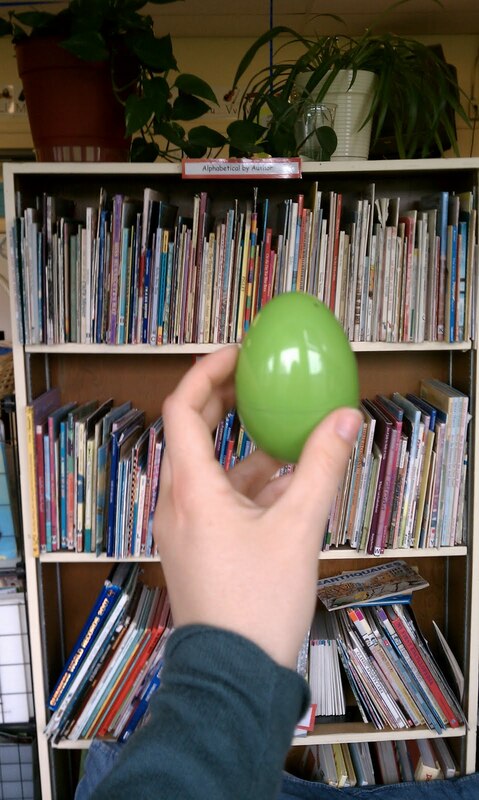 In our school the Junior High students just brought one egg and declared as they entered the room “you’ve been egged!” Then I made a big deal out of it, and showed the kids what she would be doing for me (us) sometime next week. The Head Junior High Teacher had given us a heads up and even let us write a wish list for the students to pick from. We included personal things like our favorite Starbucks drink, errands they could do for us, or tasks they could help us with. One office lady is getting her desk cleaned out, and the 5th grade teacher received an inspirational talk about “doin your best” given by the student herself! So inspiring and what a blessing to me. Plus the First Grade Friends got to see what the “big” kids were doing too!